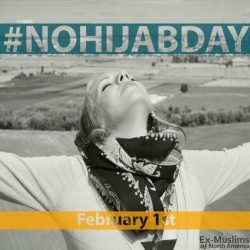 YOU ARE HERE:Home » blog » Support #NoHijabDay on February 1st! One piece of fabric, a thousand different views. To religious Muslims, the hijab is a symbol of piety and purity. To other Muslims and ex-Muslims, it represents conservative shackles. World Hijab Day started in 2013 by Nazma Khan in recognition “of millions of Muslim women who choose to wear the hijab and life a life of modesty”. In solidarity, activists encouraged women to put on the hijab. Many public figures, like Asra Nomani and Maajid Nawaz, criticized Hijab Day as a conservative campaign. They accused it of giving the misleading idea that hijabs are always worn voluntarily. Campaigners against the forced hijab have been organizing counter-protests. In December of 2017, Iran erupted in protests to forced hijab laws. The iconic image of a woman waving her white hijab started a chain reaction of women protesting for their rights. Iranian journalist Masih Alinejad organized and unified these protesting voices with campaigns like My Stealthy Freedom and White Wednesdays and activists from around the world joined in. These movements led to tensions in Iran and the imprisonment of at least 29 activists, many of whom remain in prison. Now, activists like Yasmine Mohammed, Ensaf Haider, and we at Ex-Muslims of North America are using the hashtags #NoHijabDay and #FreeFromHijab to bring attention to the pressures behind wearing hijab. “As a person who had her childhood snatched away by the hijab at age 9 and was threatened with death for removing it, I intimately understand the enormous pressure on women to wear the hijab”, says Yasmine Mohammed. “Most women can’t speak up or they will suffer dire repercussions, but we can fight for them”. Women should have the right to wear the hijab, and the right to take it off too. Join us and share your views, stories, or pictures and spread the message. Be sure to share your support for #NoHijabDay!